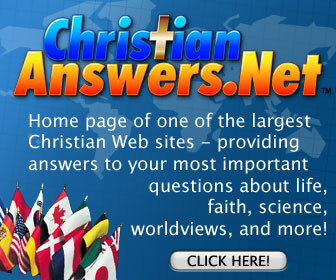 Christian Answers Network—Are there answers to your questions about Christianity? Various respected Christian ministries join together to tackle tough questions about: Marriage & Family, Archaeology & the Bible, Christian Theology, Creation & Evolution, Government & Social Issues, Religion & Cults, and much more. Thought-provoking, educational, and attractive—a Web site designed for the entire family. Christian Answers Network—Are there answers to your questions about Christianity? Respected Christian ministries have joined together to help answer your tough questions about life and the Christian faith. Thought-provoking and educational, this is a Web site for the entire family. Christian Answers Network—Respected Christian ministries join together to tackle your tough questions about life and the Christian faith. If you would like to add a DROP-DOWN box like this to your page to save space, use our handy source code.